really puts it all together. It’s well researched, concise and informational. I hope you’ll take the time to read it and come up with some creative way to turn the market economy on it’s ear so small farms can once again be a profession that doesn’t require a day job to perform. I was ever hopeful for the first two years of our foray into farming that one day we might be able to ‘make a living’ as new farmers. And while I still hope for that day to come, it seems only possible if we don’t include land or even most capital expenditures in the calculation, and hope to goodness the tractor doesn’t break down. So I keep searching for ways to diversify our offerings, streamline our production to maximize efficiency and revenue, while not compromising our commitment to organic, sustainable agriculture. It seems obvious however, that at least one of us is going to have to remain ‘gainfully employed’ to keep the wheels turning. 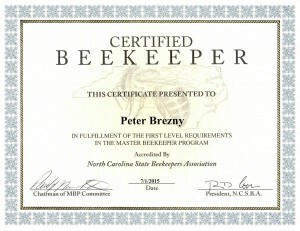 Early this summer, I passed the written and practical tests in the first step toward becoming a master beekeeper. There’s plenty of information in books and on the web for anyone to pick up caring for bees without going to the extra work of becoming certified. 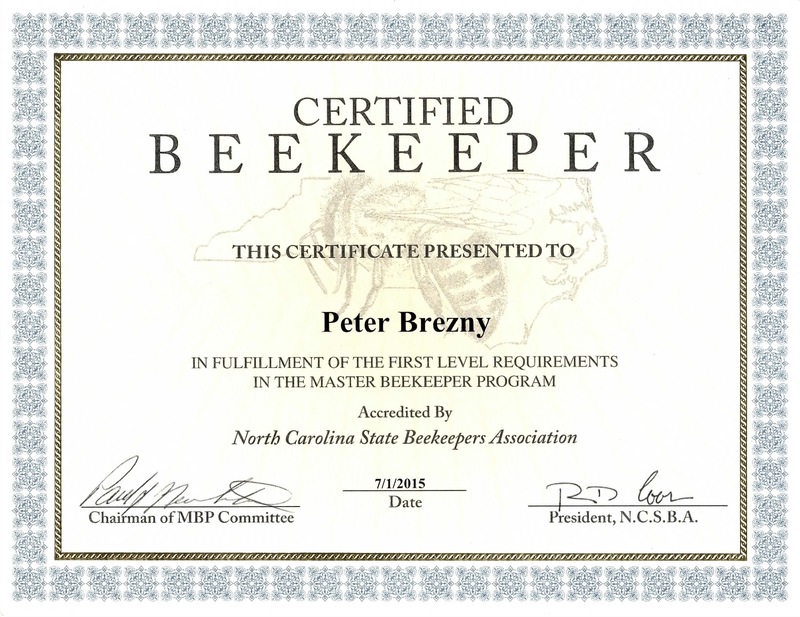 I found that having the goal of certification and the eventual multi year path toward becoming a master bee keeper spurred me on to keep studying and learning new things about bees. Becoming a “Bee Guardian” as the folks at backyardhive.com like to call themselves isn’t without its challenges. Not the least of which is the initial expense (either in time or money) of building or buying hives and purchasing or capturing a colony of bees. And if you want to be a bee guardian, you do have to accept the fact that, when opening a box with sometimes more than 50,000 insects inside, you are going to get stung at some point. It can be a little intimidating at first, even with protective clothing, to get used to the colonies normal activity, and figure out how best to interact with them when attempting to assist them in surviving this chemical and GMO filled world we have now. Here’s a short video of our hives in action from the April 2015 photo album on google plus. Just setting up the apiary or bee yard was a bit more work than I anticipated, and keeping the bees safe from Bears does require power, a well constructed fence and powerful electric fence energizer. And although after two years of learning the ropes and not collecting a single jar of honey, it’s been well worth the effort. Knowing we have hundreds of thousands of hungry little mouths to feed at the farm at any one time has really changed the way we think about weeds–at least those with flowers on them and we’re tilling up all kinds of formerly grassy areas to plant with wildflowers. We mow a lot less, which is fantastic in all kinds of ways, tolerate a lot more flowering ‘weeds’, and have been rewarded with a better understanding of these insects, and their wild pollinator cousins life cycles and importance to the natural world. 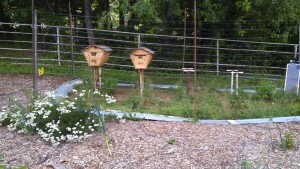 Our little apiary with two hives in use. A few technical details about the apiary. We’ve had great luck with the Gallagher b80 (0.8 joule) energizer, a 100 w solar panel, and a marine deep cycle battery. The fence itself may be a little overkill, eight feet tall with a wire every six inches, and a separate ground wire right at ‘bear nose height’ to make sure even in really dry weather, that anything attempting to get past the fence is going to get a good kick. 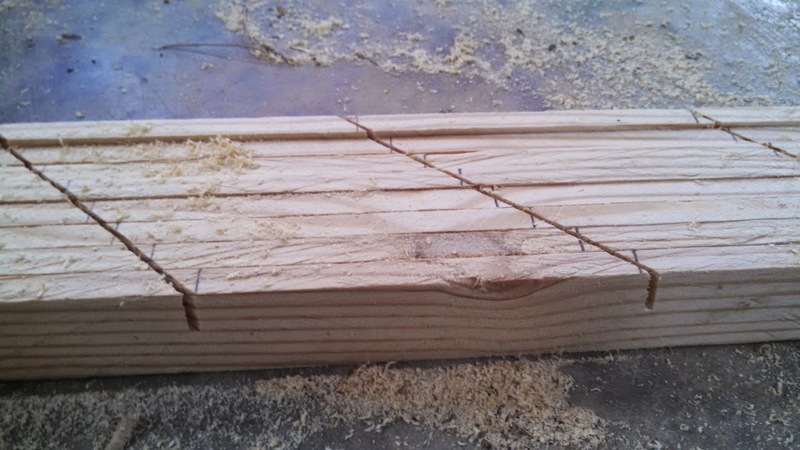 To save money and not use plastic insulators that will ultimately just wind up in the landfill, we cut diagonal notches in thin, wood strips, then used a drill to square off a hole for the wire to pass through, making it easy to push stiff wire into the strips. A few images can be found in the google plus gallery from June 2014, or see this image. The welded ‘T’ pipes driven into the ground as hive supports have been great, putting the hives up high enough off the ground to keep skunks from picking off the bees as they come and go, and making it easy to walk around in the yard between the hives without having to step over cinder blocks or trellis boards. What is your most pressing production issue right now? Please describe. Economics. The farm cannot produce enough revenue to sustain itself while paying a living wage to farm workers. The importance of this problem cannot be overstated. Real-estate as a commodity, combined with depressed food prices from agribusiness put the small organic farmer at great economic peril where land prices are so high, and revenue from farm produce so low that unless farm owners are willing to work two or three jobs, there is no path to economic sustainability, and we are forced to rely in ‘intern’ or ‘slave’ labor to keep the operation from going under. Buncombe County, where our small farm resides, has lost 1/2 of it’s farmland to development or real-estate prospecting in the last 40 years. Without aggressive conservation methods, zoning development out of farmland, and locking in discount pricing for farmers who agree to permanently reserve that land for farming, we’re faced with dire consequences. There is no protection for pristine farm land, which is highly sought after by wealthy developers willing to pay more than twice many farmers could hope to make in a lifetime of farming. That combined with depressed food prices from unsustainable labor and agribusiness practices, small farming is not a viable “career choice” for anyone who can do simple math. The economics aren’t there, and without external monetary inputs, the small American farm dies.